Ok, admittedly I’ve never actually eaten the rosemary bread at the Macaroni Grill restaurant but lately it seems like the famed bread has come up in multiple conversations I’ve had with random people. Ashamed I’d never made the much-talked about bread, I cast my memory upon a knock-off recipe my sister-in-law, Mary, sent me months ago, as well as one I had spied in a collection cookbook I’ve had for years. And I merged and adapted and variated recipes…and made the bread. Let’s just say, this bread is definitely everything everyone said and more. 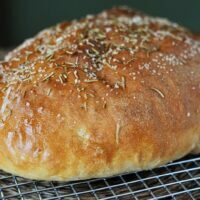 Light and tender with the delicious aroma and flavor of rosemary combined with the subtle crunchy saltiness from the coarse salt, this bread is over-the-top tasty…plain or dipped in balsamic vinegar and olive oil. It’s hard to admit to you, my friends, how many slices of this bread I ate slathered in whipped herb butter. I have always loved a good bread/butter combo but this wonderful rosemary bread pretty much exceeded all my carb cravings. And I can’t believe I’m actually admitting this, but for the first time in my entire existence, I would take a slice (or four) of this bread smothered with the garlic and herb butter concoction over an offer of dark chocolate. I’m not sure I know who I am anymore. The bread is not complicated in the least and is free-formed, eliminating the need for bread pans – truly, it is worth making! I just hope when you make it, one of the two loaves makes it into the freezer…or to a neighbor…or to some worthy cause…because it’s all too easy to down both loaves before realizing what exactly happened. In a large bowl (or the bowl of an electric stand mixer if you have one), combine the yeast, sugar and water. If using active dry yeast, let the mixture stand until foaming and bubbly, about 5 minutes. If using instant yeast, proceed with the recipe. Add two cups of the flour, salt and 1 1/2 - 2 tablespoons of the chopped rosemary. Mix. Continue adding flour, gradually, until a soft dough is formed. Judge the dough based on texture and feel versus how much actual flour you've had to add based on the recipe. The dough should be slightly tacky to the touch but should hold it's shape while still being soft and smooth. Knead the dough by hand or with an electric mixer for 4-5 minutes, adding additional flour only if the dough is overly sticky and not clearing the sides of the bowl. Transfer the dough to a lightly greased bowl and cover with greased plastic wrap. Let the dough rise until doubled in size, approximately 1-2 hours, depending on the warmth of your kitchen. Once doubled, gently deflate the dough and divide in half. Prepare a rimmed baking sheet with parchment paper, a silpat liner or lightly grease with cooking spray. Shape the dough into two smooth, oval shaped loaves and place them on the baking sheet, one on each half of the tray so they have room to rise and bake without touching. Use a brush to slather the melted butter over the top of the loaves. Continue brushing on the butter until it is gone (the loaves will be well-saturated). Sprinkle the remaining chopped rosemary over the top of the loaves, patting down gently to set into the dough, if needed. Cover the loaves with lightly greased plastic wrap and let them rise again until puffy and nearly doubled, about an hour (again, the exact time will depend on temperature so judge the dough by how it looks). Preheat the oven to 425 degrees. Lightly sprinkle coarse salt over the top of the loaves. Bake the loaves for 18-20 minutes until browned and baked through. Transfer to a cooling rack to cool completely. Update 2/25/15: I originally posted this recipe using dried rosemary. However, except for one or two times using dried, I started using fresh and the difference is noticeably delicious. If you can get your hands on fresh rosemary (usually widely available in grocery stores near the salad ingredients), definitely use it. If not, dried will work in a pinch. Reduce the amount to 1 1/2 tablespoons (using 1 tablespoon in the dough and the remaining 1/2 tablespoon on top). Recipe Source: adapted from a collection cookbook given to me by my sister-in-law Erin W., as well as a recipe sent to me by my other sister-in-law, Mary G.
About to put second round of this bread into the oven! This bread is the BOMB DOT COM! We used to have a macaroni grill right by where we lived and used to go all the time just for the bread! We have since moved and our nearest one is 1 1/2 hours away sadly. Let me tell you this is spot on!!! They served it with a bowl of high end olive oil with fresh ground black pepper. Yum yum yum! I definitely used all four cups of flour both times. Thank you for creating this recipe you have made this carb loving girl VERY HAPPY!! Oh. My. Goodness!!!!!!! This bread! I have mentioned my love for it in comments for other things on your site…but apparently, I have never commented here, and that is a shame. I could truly eat an entire loaf myself…I don’t, but that is only because I try to exercise self-control once in a while. I think it is good enough to eat without anything on it. I love to just slice it up and eat it along side whatever else I make for dinner. My children and husband like it with a little butter on it. Anyway you eat it, it doesn’t disappoint. Thank you so much for this recipe! Delicious and so perfect for a weeknight meal! I love it. Best eaten the same day (I tried to save one loaf for the next day’s dinner, too), but it won’t be hard to gobble it all up because it’s delish. Love the salt on top, too. And great with olive oil. Love this bread! I’m having a difficult time getting the crust a bit darker though. Any pointers on how you baked yours to achieve such nice color? Thanks! Sometimes it’s a simple fix – moving the oven rack lower or higher. In my oven, I’ve found my rolls and breads brown best if baked in the upper third of the oven (assuming there’s room for them to rise without touching the top of the oven). Not super close to the broiler element, but above the midpoint of the oven. Also, turning the oven temperature up 25 degrees can help too. This is the most delicious bread I have ever made! I made it for a meeting my husband was having; let’s just say that I’m very happy there are two loaves. Suppose one soaks the dried rosemary in the 1 1/2 cups of water used in the bread? Boils it and lets it cool to 108 degrees F. ? Then strain out the rosemary (or chop it fine if you want to use it)? It is the just the flavor of rosemary one is after, right? Sounds like it’s worth a try! Not sure if the rosemary flavor will be stronger or not, though. Yes, I believe so. I had a friend in Minnesota that made the dough and kneaded it in her bread machine. I made this bread tonight after being able to sample it this past Tues. YUM! I used herbs de provonce since I didn’t have any rosemary at all. It turned out great. Also, used much less butter and it was still so yummy! If you are looking for a local person to buy white wheat from, let me know and I can give you her e-mail. I buy mine from a farmer in Ontario. Its so much cheaper to buy farmer direct. Thanks for checking in on this bread, Megan! I have herbs de provence in my cupboard and may have to try that sometime, too. I would LOVE the contact for white wheat. Thank you! Found this on pinterest and I just tried it yesterday. So delicious! I finished one loaf by myself (oops!) lol. I used about 3 3/4 cups of flour, they rise beautifully! Just like your pic. But not ad brown and glossy, even though I used all the butter as per recipe. Wonder why..
Love the recipe! I read where you had issues chopping the rosemary. I found using a mortar & pestle worked for me to keep it from flying all over the kitchen. Just press on it to break it up. Also, I baked my bread in a cloche and it came out really well. This bread is amazing!! My super picky eater son just told me this is the best bread ever 🙂 Thanks Mel! I know I’ve never met you, but I consider you one of my BFF’s ha! I use your website almost exclusively. Thank you thank you for making me a rock star in the kitchen too! Thanks, Erin – so happy you loved this bread. It’s honestly one of my favorite bread recipes ever! 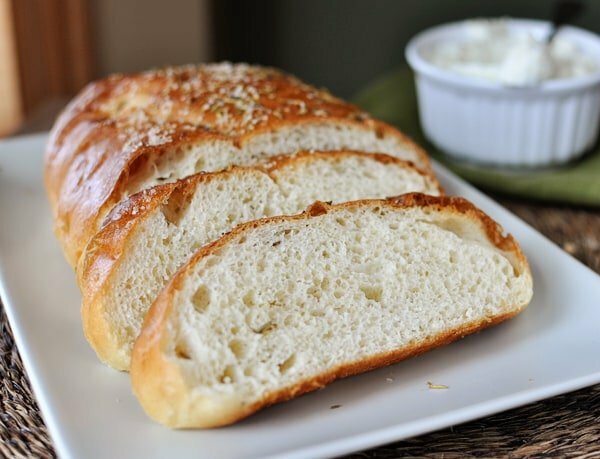 This is one of the most delicious breads and so easy to make! My family wants it doubled next time. Thank you for the tip about putting the rosemary in a bag before trying to chop it. It was rather exciting when I first tried. I was wondering if you generally use all 4 cups of flour when making this bread? I’ve read other comments and I’m thinking I may not have used enough flour because my loaf is flat. The dough seemed like the right consistency, but I’m also a novice at baking bread. I used about 3 1/4 cups of flour – should I try 3 3/4 cups next time? Thanks! Hi Lindsay – did your bread rise well – just out instead of up? If so, then yes, I think a little extra flour will help the bread hold its structure a little better. Let me know if it works out better to use a bit more flour (just take care not to add too much flour or the dough will be too stiff and won’t rise well/bake up dry). Love your blog! I’d long given up making bread as every time was a disaster! I decided to try again recently with your thanksgiving rolls and they were a success, now trying this recipe. The only issue I have, is often my free form bread rises sideways rather than up, so I end up with a flat loaf. Still tastes good, but do you have any idea how to remedy that? Fenella – Is there any chance you may be underflouring the bread a bit? Usually a bread that has enough flour will hold it’s structure better than an underfloured loaf. The next time you try it, add a bit more flour and see if that remedies the problem. Good luck! Thanks, I’ll try that next time! I’m also wondering if these would work as rolls? I’m thinking they’d be delish with some ham sandwiched inside for Easter! Lindsey – I haven’t tried this dough as rolls but I’m guessing it would work really well – just rolling the dough into balls instead of shaping into loaves. Yum! Fabulous! Made on a whim for my daughter’s birthday party, using fresh rosemary. It was gone in minutes! My loaves were a bit flatter – since I only decided to make it at the last minute, I quickly whipped it up by hand and I think it could have used a bit more flour. I suspected as much while kneading but didn’t want to overflour it, either. But, as my husband said, more salty rosemary crust per piece! Definitely not a bad thing! Mel will this recipe work as rolls I planned on making this same thing but in rolls this weekend and normally do the quick PW version which uses defrosted rolls but forgot to grab them. I have made this bread several times. I even shared:) Thanks to you my in-laws loved this and friends have asked for the recipe! My kids and I are in love! Thanks for posting this!! Love this recipe but tweaked it a little & added 1/4 teaspoon ground black pepper, 1/4 teaspoon dried italian seasoning & 3 tablespoons olive oil–yum! My husband eats it all day long! Better than Macaroni Grill!!! My husband said it was the best bread he has ever tasted! Took the second loaf to my Aunt’s and it was gone within seconds! Thank You!! wilfai – I’ve never made this into a braided loaf. You’d have to experiment with it, but I’d separate it into sections after it has gone through the first rise. Thanks for recipe. My friend makes a beautiful braided bread and i would like to try it with this bread. 2. At which point would I separate it into the 3 ropes for braiding, after it has risen? Hi Lori – making the dough in advance is a good idea. I think you could easily make the dough the night before and refrigerate it after you have shaped it into a loaves, brushed with butter and sprinkled with rosemary (but don’t let it rise shaped as a loaf yet). Cover with greased plastic wrap and let it rest in the fridge overnight. It may puff and rise a bit which is fine. Then, take it out 1-2 hours before you want to bake it. You should be good to go! Good luck. I have made this bread many times now and it’s always a hit! I’m making a big birthday dinner for Sunday after church and this bread has been requested. We’re changing to 11:00 church this week (boo) so wont be home until at least 2:30 if not later, and with it being fast Sunday, everyone will want to have an early dinner. Would it be ok for me to make the dough the night before and refrigerate it at some point? Maybe let it do the first rise, form it into loaves, put on the butter and everything, then stick that whole cookie sheet in the fridge? Could I then let it come to room temp and rise the last time for about 2 hours when we get home? I’ve never done anything like that before, so I would love to know what you would advise. Thanks so much! Wonderful bread. Added fresh rosemary instead of dried n also shredded cheddar into the dough. Love the smell …. Tks for the delicious recipe..
Kristi S – I’m glad you loved this bread (and sounds like your husband did, too!). I have frozen it and it freezes pretty well. I’d say it might be just a touch on the dry side after thawing but I reheated it briefly in the oven (about 5 minutes at 250 degrees) and it tasted great. Wow!!! I made this bread yesterday to go with our anniversary dinner, and it was AMAZING, easy, and exactly like the bread a Macaroni Grill (even though I forgot to salt it before it went in the oven… oopsie!). My husband couldn’t stop raving about it during dinner and told me this morning that he got up in the middle of the night and devoured the ENTIRE second loaf and would I pretty please make some more to go with spaghetti tonight! LOL Have you ever tried freezing this bread? That might prevent my sneaky man from putting his grubby paws on it while I sleep! LOL Anyway, thanks for another awesome recipe Mel!! You make me look good in the kitchen! Doubled the recipe for my Bosch and it turned out pretty good…little flatter than yours so I’m thinking more flour next time based on all the previous comments. I’m still learning that mixer! And it was not as “shiny” as yours…totally an aesthetical thing I know, but it bugs me if I can’t get something to look right! Lol! I’m all about presentation 🙂 Any thoughts? Thx for the fab recipe as always!! Bridgett – hm, not sure why it was less shiny. Did you use the full amount of butter slathered on before baking? made this for sunday dinner and it is divine! so good with the little crust of salt on top. it was delicious dipped in olive oil and balsamic vinegar. Thanks! I’ll try that next time. I should have checked for your response before I started baking! Did you ever post the herb garlic butter recipe? Ashley – I’ve used half white whole wheat before (and half all-purpose) with great results. Have you tried this with white whole wheat? This is my second time making the bread and both times it’s been amazing but flat. I feel like the dough looks smooth, tacky and soft and holding its shape. It doubles in the bowl and in the loaf. But I have noticed that the loaf spreads as well as rises. The cooking also seemed to flatten it more. A question, could altitude affect this? I live at nearly 5000 ft.
Davis – if the loaf is spreading too much while rising your dough probably needs more flour – even as much as 1/4 cup extra flour or so will help the dough keep it’s shape better while still maintaining a soft crumb. Elevation can definitely make a difference with how much flour is needed – generally higher altitudes require a bit more flour in everything from yeasted breads to cookies and cakes. Good luck! I have made this recipe a few times already. We love it! No need for any butter at the table, the flavor is all in the bread! Thank you for sharing this recipe! We eat out rarely, but this bread is one of my favorites! Can’t wait to give it a try. It’s been too long since I’ve been to Macaroni grill to remember what the bread tastes like, but I made this yesterday and paired it with a Macaroni Grill Chicken Cannelloni copy-cat recipe and it was AWESOME!! I made the bread by hand. I was pretty impressed by how well it raised and everything given that I’m not very experienced in bread making! So yummy. Now I’m going to make that garlic butter spread….I have a feeling the second loaf will disappear extra fast! My husband’s company makes the Mac Grill bread for the restaurant chain and sorry I can’t divulge the recipe. The chef at any Mac Grill wouldn’t know the actual recipe as it’s made from another company. He has managed the production of this bread for years and my kids have grown up enjoying it. Whenever you visit the bakery it smells like Mac Grill Bread but so did his clothes. 🙂 Be sure to warm it and dunk it in some good olive oil. This was soooo great. Even the yeast looked beautiful as it foamed. And salt on bread= heaven. Marci – I think Andy may be right if your bread hadn’t cooled long enough. Do you think that could have been the problem? Andy – not enough kneading can inhibit rising in the bread (thanks to lack of gluten development) but also overflouring could have been a culprit, too, which is quite easy to have happen when making bread by hand. I’m glad you liked the finished product, though – I’m impressed you made it by hand, way to go! I used the recipe yesterday and the bread was delicious! Although, it didn’t rise as much as I expected, so it was a little dense. I dont own a mixer, so i did the kneading by hand. Would under-kneading prevent it from rising as much? It was still quite tasty. Marci- Sounds to me like you didn’t let the bread cool long enough. I let mine sit for about two hours. If your bread was still warm on the inside, the slight condensation that would naturally occur in cooling was trapped in the bag. The salt looked like it melted because it was soaking up the excess water. Is it wierd that when I put my leftovers in a ziplock, the course salt kind of melted and it got really moist on top? Marci – rapid rise yeast is the same as instant so the yeast shouldn’t be a problem. Flour (either underflouring or overflouring) can definitely make a difference with rising. Usually if it is underfloured, the dough will spread out instead of keeping it’s shape and rising so you end up with more of a flatter loaf. With overflouring, the dough generally keeps its original loaf shape but doesn’t build volume. If you think you underfloured, try adding another 1/4 cup to 1/2 cup flour (gradually) next time and see how it comes out. Good luck! Andy – I use table salt in the bread dough recipe and use coarse kosher salt to sprinkle on the top of the loaves. What type of salt are you using? My bread was delicious as well, especially with that spread! My biggest problem with bread is always that they don’t raise as much as they should. I use a rapid yeast, and I may not have put quite enough flour, I did three cups. Any suggestions? I loved how easy the dough was to work with and the bread even survived my (a) making it rise in/near a warmish oven so I could reduce rising time (impatient and on a tight schedule) and (b) accidentally baking the first fifteen minutes on 350–I was wondering why it wasn’t browning (I have three little girls ranging 4 months through 3 years, so I was rather distracted). It was STILL WONDERFUL! I LOVE crusty artisan breads, especially dipped in olive oil and balsalmic with fresh ground pepper. I froze the other loaf immediately after dinner as I plan to use it for dinner next week or I know we would have gobbled it up. It has been years since I have been to the Macaroni Grill. I made this yesterday and felt like I was sitting in the restaurant. It brought back lots of fond memories. This is awesome and easy! Thanks so much for sharing this! I used my baking stone this time. I let the loaves rise on individual pieces of parchment on my pizza peel, then baked them one at a time on the preheated stone, like the instructions for Rustic Crusty Bread . It worked very well. I look forward to using fresh rosemary the next time I make it. Lyndsay – I buy my unbleached all-purpose flour in 25 pound bags at Sam’s club and I grind all of my whole wheat flour using white wheat berries bought various places (Walmart when I can find it, online and at my nearest LDS Home Storage Center which you can use whether or not you are LDS). That is my favorite restaurant bread on the planet! Can’t wait to try this one! MMMM can’t wait to try this. I am currently loving your Grandma’s French Bread recipe. Just curious…where do you buy your flour since you make all your bread and pancakes from scratch. Marci – I’d recommend baking them both and freezing one loaf after cooling. Boy this brings back memories! I worked for Macaroni Grill for several years in college. I could take their bread some meat sauce and freshly grated parmesan cheese and make an entire meal out of it! 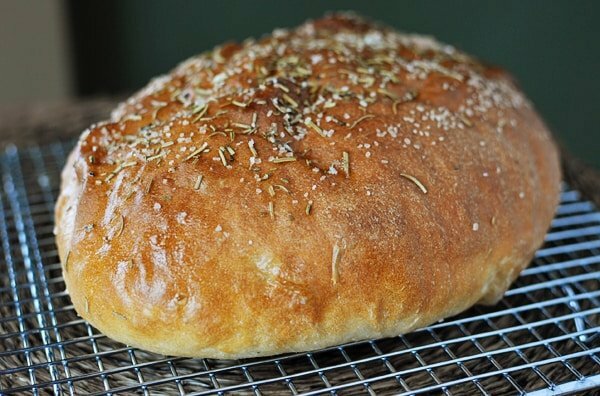 I haven’t set foot in a Macaroni Grill in for-ev-er (mainly after eating, smelling, seeing the food for so long I couldn’t stand it after a while) but would love to try this homemade version of the beloved rosemary bread to compare it to what I remember. My bet is that this version is much better since it is homemade! I will have to try your recipe for this – the one I’ve used in the past specifically says not to knead the dough, and the dough is extremely sticky and hard to work with, although the bread always tastes really yummy. For those having difficulty chopping the dried rosemary, I use a small mortar and pestle that my sister gave to me, and it works great. I think she got it from Orson Gygi or somewhere like that. If I only need one loaf, would you suggest freezing the other in dough form or cook them both up and and freeze it after it’s been baked? I made this tonight to go with dinner it was very yummy! Thank you! Fun to see that you tried the recipe! 🙂 And I’m glad you liked it enough to post it too! I have to say that in my opinion it tastes much better with fresh rosemary… I don’t know if you tried it that way, but it’s amazing the difference between the dried and the fresh. We like the bread so much that I planted rosemary plants in our garden and transplanted them to indoor pots for the winter so that we would always have fresh rosemary available… 🙂 Anyhow, it was fun to see this posted! Keep up the good work! We love ya! I enjoyed seeing your recipe. I’ve made a knockoff myself, completely without meaning to! Far as I can remember, mine was really nothing more than sourdough with rosemary and olive oil mixed in. Fun to compare different recipes! thank you – I’ll add a bit more flour next time. and there will be a next time. I’ve never actually had the rosemary bread either, but the flavors sounds delicious. Anything that involves homemade bread sounds good to me! I love Macaroni Grill bread. I fill up on bread and take my entree home, it’s that good. I can’t wait to give this a go, but I am waiting for the butter recipe–you are such a tease! Mel, this looks fabulous, and so easy. It’s perfectly golden brown and fluffy, too. My kind of bread! 1) Yes, dried rosemary is quite a nightmare to chop. You could definitely sub fresh rosemary in this recipe which is easier to battle with a knife, but I do like you do and put a paper towel or something over the rosemary while I chop it. I’ve almost thought that I should try putting it in a ziploc and crushing it with a rolling pin or mallet – I may try that next time. If it were me, I’d do something similar – letting the loaves rise on individual sheets of parchment paper then sliding them (with the parchment paper) onto the baking stone to bake. If you have a pizza peel, you could dust it with cornmeal and slide the loaves directly onto the stone without parchment paper. Let me know if you try it that way! sweetpea – did your dough seem overly sticky? They might have flattened during baking if they were underfloured or if they rose too long or too quickly after being shaped into loaves. I’d try adding a bit more flour and see how it goes next time. Good luck! I LOVE the bread at Macaroni Grill! Can’t wait to try this…I think I’ll wait for the butter spread recipe first though. You are the best! just delicious!! (flat-tish or not) and so easy! Thank you. Today I needed something to make me feel good and this was just the ticket. It tastes just like I remember it at Macaroni Grill–and I remember devouring basket after basket of it! I had prepared a little dish of olive oil and freshly ground black pepper to dip it in (as if it needs it!). When it came out of my oven, I ate a whole slice before I could bring myself to stop eating long enough to dip it into the oil. It’s Great With AND WithOUT! QUESTION 1: in order to chop the dried rosemary that comes in the bottles in the spice aisle, I had to lay a kitchen towel over the cutting board and chop away blindly. Otherwise it was flipping all over the counter. It worked fine, but is this the right rosemary to use? QUESTION 2: it seemed to me that a pizza stone would lend itself well to baking this bread. I raised the loaves on parchment paper on a cookie sheet and preheated the oven with the stone in it. I baked it on the sheet on a rack just above the stone. One of the bottoms didn’t finish baking in the time allotted, so I left it by itself directly on the stone and it browned nicely in just a couple minutes. Would you suggest any other ways to try it with the baking stone? There are never enough different kinds of bread to make! I love the bread at Olive Garden! This recipe is definitely going into the “must make” stack! The kitchen is going to smell so good! flour? (they rose beautifully). Can’t cut into til they are totally cool!! I had the same issue, my loafs came out flat-ish, and still delicious. Is it the flour? Sounds like you might need a bit more flour or I’ve found with this recipe that the shaping of the loaf makes a huge difference whether it rounds or flattens. Make sure it’s shaped into a very round, taut ball. If it flattens while rising, don’t be afraid to reshape it and let it rise again. Mel, I have a garlic/herb mix you put in the oil and vinegar much like what you get at Carrabba’s that is amazing with this bread. Let me know if you want me to email it to you!! This is amazing—I saw this post this morning and thought—“i’m going to have to try that”– Well, here it is 3 and I’ve just devoured my first slice of it….so, so good!!!! Am I the only idiot on your site that doesn’t know how easy it is to make bread? I swear! All you people are so confident and make crazy, beautiful things! I’m still just a tiny, wee baby with baking. Thanks to Mel I’m taking more chances and her fool proof recipes make me feel like a million bucks when I pull a loaf of bread out of the oven that looks just like hers! Mel is my hero! Everything there is to know about cooking (and baking) I learned from Mel! Okay, so since I made the Rustic Crusty bread and it was gone before I hardly had a chance to taste it (and made YUM paninis with it too – turkey club! ), I am going to now take this one on in confidence that I can do this. I don’t remember the Mac-grill bread, but I love me some rosemary and the picture is just to die for. Breathing deeply…I can do this, I can do this. Love, love LOVE this bread. My girlfriends request that I make it almost every time we do lunch together. There is rarely a slice leftover. Somehow my mom got the actual recipe from a chef at our local Macaroni grill. I’ve been meaning to try it but never have the time for yeast breads! Thanks again for a recipe I know will be wonderful. I have tried Macaroni Grill’s bread and we always ask for extra bread so we’ll have some to take home! I will be making this today! I could just go eat their bread with some iced tea and call it a meal. You are now my hero for posting this (and admitting to eating excessive amounts of this like I surely will) !! I love Macaroni Grill’s bread!! I can’t wait to try this recipe!!! Merged and adapted and variated…she let’s us in on the scientific process by which she concocts her foolproof recipes. And she presents a bread worth choosing over chocolate. Happy Monday!